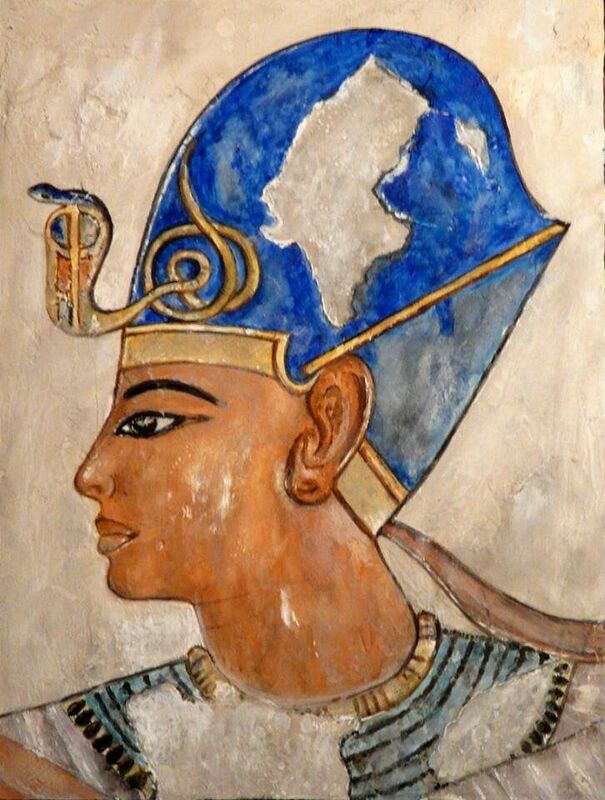 1- The Hedjet Crown or White Crown , symbol of Upper Egypt. 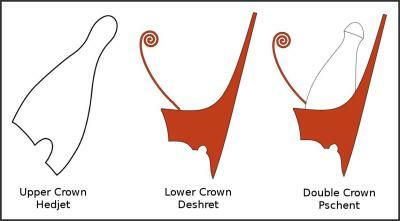 2- The Desheret Crown or Red Crown , symbol of Lower Egypt. 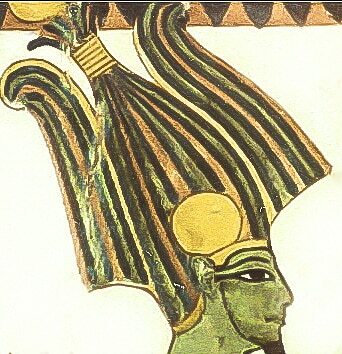 3- The Crown Sejemty or Double Crown, symbol of unified Egypt, is a superposition of the two previous crowns. 4- The Atef Crown or Osiriaca Crown , present in some funerary rituals. 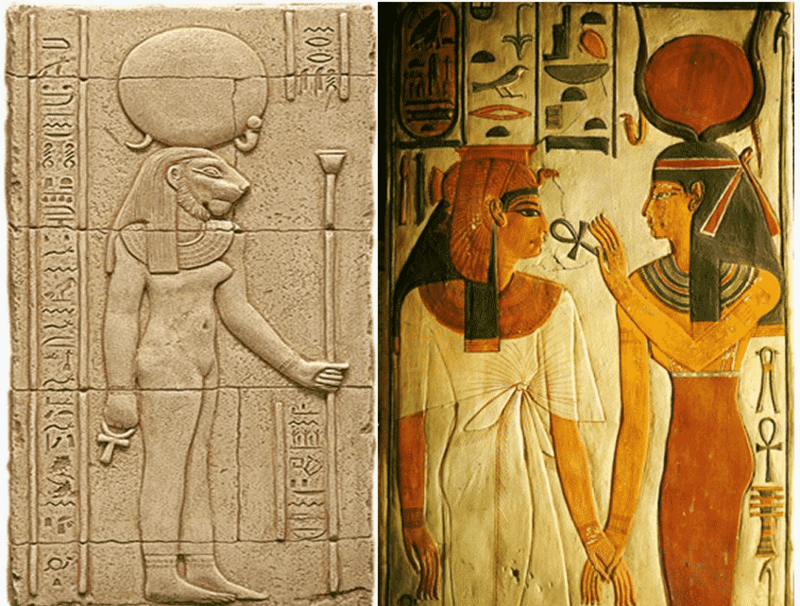 Precisely, the funerary cult was the sphere of influence of the god Osiris. 5- The Crown Khepresh or Blue Crown , of still dark meaning, but very used from the New Empire. 6- The Shuty Crown or Plumed Crown , which eventually came to be used by the Great Royal Wives and the Divine Adorers . 7- The Crown Hemrem or Triple Atef , composed of three Atef crowns and some accessories; It seemed to have a solar function. 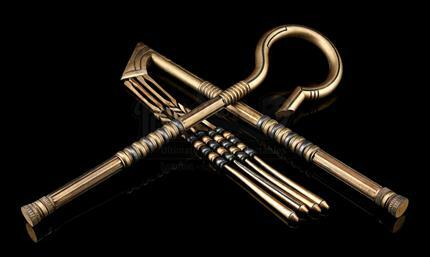 Originally linked solely to the god Osiris, the crook and flail later became a combined symbol of pharaonic authority. The shepherd’s crook stood for the power and responsibility of kingship, while the flail was shorthand for the fertility of the land. The ankh, which is usually grasped in the left hand of a pharaoh, is one of the most important symbols associated with the pharaohs. It represents the concept of eternal life; a state of being that was close to the hearts of the pharaohs, as represented by their tombs and monuments. The ankh also represents religious pluralism (all gods as one). Less of a crown and more of symbol of a pharaoh’s power, the nemes was a headdress that covered the whole crown, the back of the head and the nape of the neck. 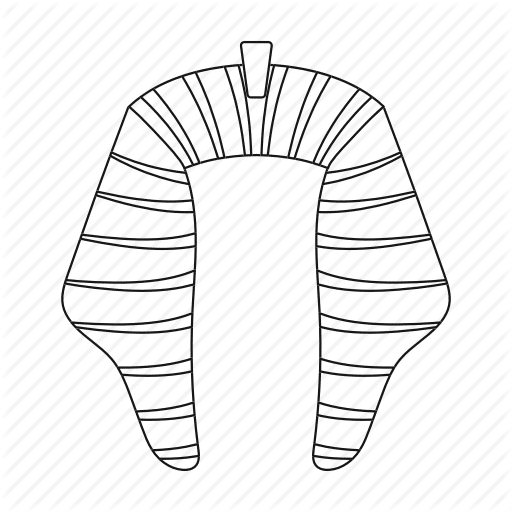 Usually striped with gold (to represent the ruler’s wealth), the nemes had two large flaps that hung behind the hears and draped over the front of the shoulders. Like Osiris, the pharaoh is also going to wear it. However, it must be said that this beard was not always the same. When Pharaoh was alive, he represents himself straight, without braiding. 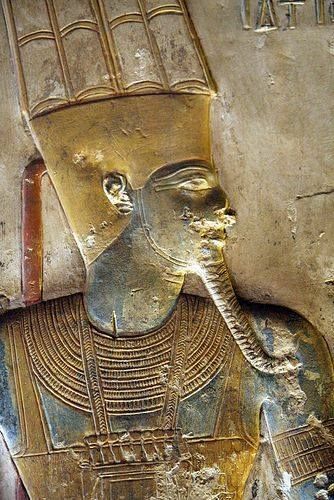 However, when the pharaoh is represented already deceased, the beard appears braided, like that of Osiris. The Egyptian symbols were used during different periods of Egyptian civilization to represent all kinds of concepts and ideas of its religious or cultural tradition. Many of these symbols were related to some Egyptian god. The Egyptians used these symbols to decorate their temples, to represent their gods in their inscriptions and to make amulets to cope with difficulties.